As a testing organization, it is important to continuously review testing trends and improve the process. To date, analyzing trends in tests has been limited to homegrown or third party apps. However, with the recently released Sauce Labs Test Analytics, we have reviewed years of anonymous data to uncover common test trends that can help modern development teams test more successfully. 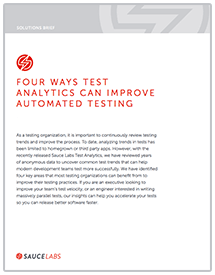 We have identified four key areas that most testing organizations can benefit from to improve their testing practices. If you are an executive looking to improve your team’s test velocity, or an engineer interested in writing massively parallel tests, our insights can help you accelerate your tests so you can release better software faster.